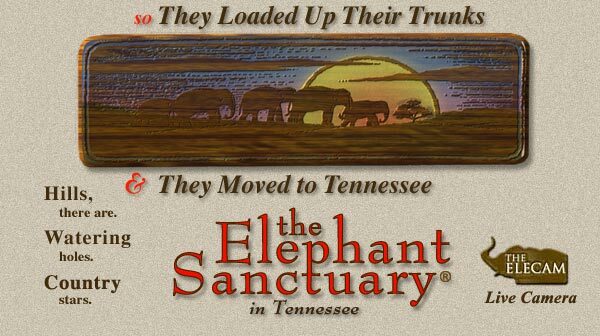 Located in Tennessee, The Elephant Sanctuary is the nation's largest natural habitat refuge for old, sick, abused, or unwanted elephants. The heffalumps are cared for by an on-site veterinarian in state-of-the-art facilities. When they're healthy enough, the elephants are encouraged to forage, and live off, the sanctuary's 2,700 acres. TES is non-profit, and closed to the public: after decades of inhumane living conditions at roadside circuses and shopping mall parking lots, the sanctuary founders feel that it's time to let the elephants be elephants again, with as little human interference as possible. You can visit all the Sanctuary elephants online, and when you donate, you'll be kept up to date on all the happenings with the Sanctuary newsletter. Heffalumps eat a lot, so please click on www.elephants.com and give generously.